While many destinations are struggling with too many tourists, Paramaribo Suriname is largely unknown. In fact, you’re not alone if you don’t know where Paramaribo or Suriname is. Sandwiched between Guyana and French Guiana in the northeastern coast of South America, Suriname, a former Dutch colony does not have direct flights flying in from the US. The only direct flight you’ll get is from Port of Spain (Trinidad), Amsterdam, Curacao, Aruba and Georgetown (Guyana). Just over half a million people live in Suriname, and 90 percent of the population live in Paramaribo, the capital and along the coast of the country. Paramaribo isn’t exactly lacking in tourist attractions and here are at least five reasons to visit. …are a fusion of Dutch architectural influence with traditional local techniques and materials. 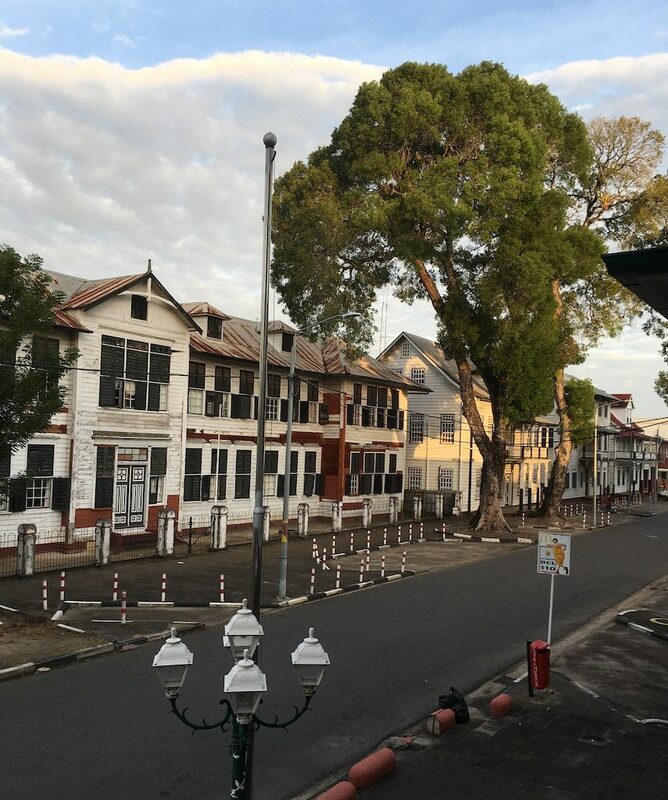 A former Dutch colonial town, Paramaribo still has the street plan of the 17th and 18th centuries lined with rows upon rows of white wooden houses. 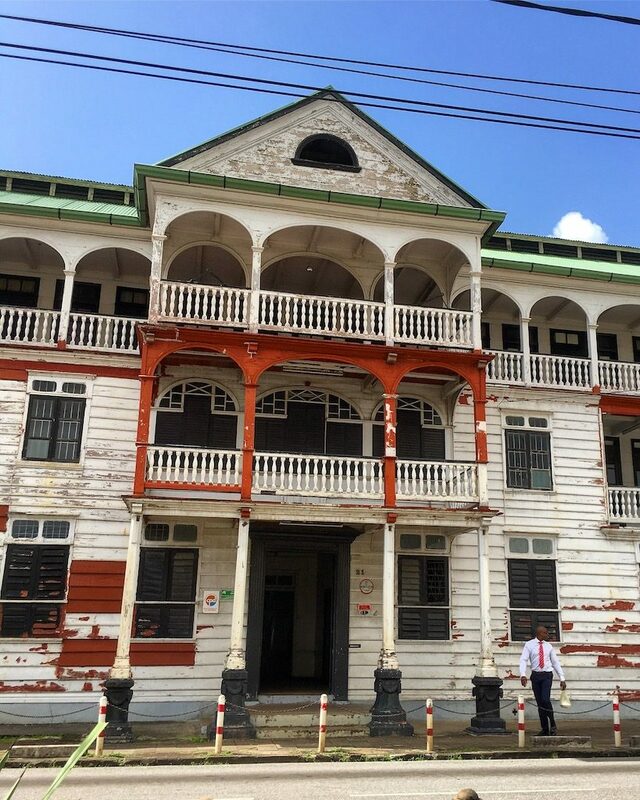 Most of the exceptional buildings are located in the Historic Inner City of Paramaribo, along the left bank of the Suriname River between Sommelsdijkse Kreek to the north and the Viottekreek to the south. Some to look out for are the Dutch officers’ houses and the Presidential Palace. You can find the ultimate fusion of food in Paramaribo Suriname. Paramaribo is South America’s melting pot, with a perfect blend of indigenous, Creole, Indian, Javanese, European, Chinese and Jewish cultures. There are 15 different languages spoken in Suriname, but Dutch is the official language. African slaves were brought in during colonial times, followed by indentured servants from India, China, and Indonesia (Java island). The Spanish and Portuguese Jews arrived in Suriname in the late 1600s. 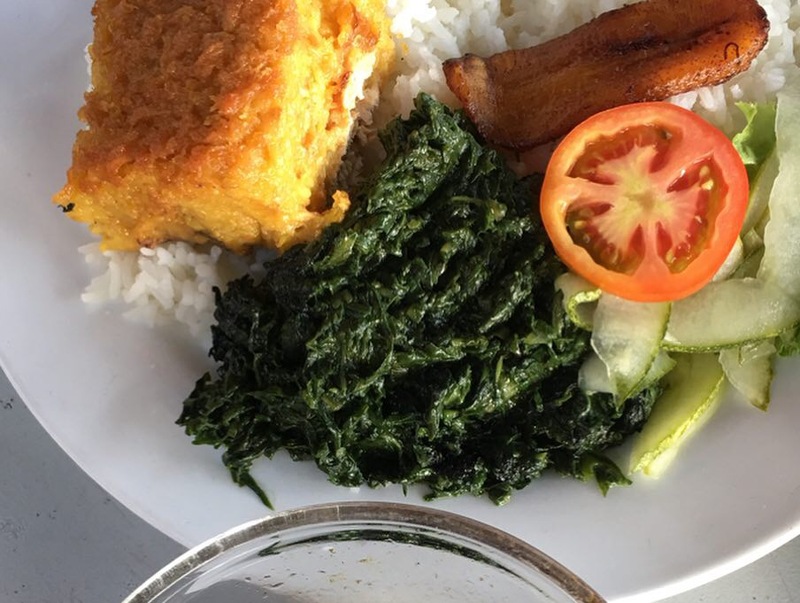 All the different cultures can be found in two notable Surinamese dishes – moksi alesi (mixed rice with meat and vegetables) and pom (a Surinamese-Jewish dish made of pomtayer, a type of taro). Try it at De Gadri Restaurant by the Suriname River. You don’t have to travel to Indonesia for authentic Javanese food. Paramaribo has the best Indonesian fare in South America. Find nasi campur, known as nasi rames and nasi goreng in the affordable Warung Renah or the expensive Mirosso Indonesian Restaurant. Nowhere in the world will you find a mosque and a synagogue located side by side. But it exists in Paramaribo. Neveh Shalom Jewish Synagogue was built in 1835, and the Suriname City Mosque was completed in 1984. Its the largest mosque in the Caribbean with towering minarets and domes. The Neveh Shalom Synagogue’s entire floor is covered with sand. The pews are made of dark mahogany, and there’s a brass chandelier in the middle. One of the most impressive religious institutions is the wooden Gothic Revival style Roman Catholic Cathedral named Saint Peter and Paul Cathedral. It is the largest wooden church in the Americas. The inside is made of unpainted cedar wood. Built in 1885 and completed in 1901, this magnificent structure lacks one thing – the church organ. The historic Dutch Reformed Church is another interesting religious institution to learn about the history of Suriname. There aren’t many countries left in the world where you’ll be the first among your friends and family to visit. Every day by 5 pm, the streets in Paramaribo are almost empty, all retail shops and office buildings are closed for the day. 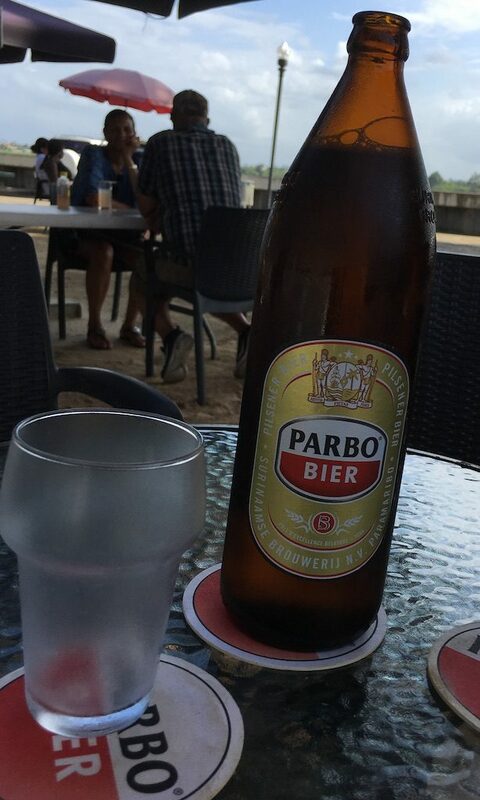 Paramaribo’s tropical weather is ideal for a few chilled beer and local snacks. The best place to do that is at a restaurant by the Suriname River – by Waterkant. We recommend getting plantain chips, spicy Indonesian tapioca chips or regular tapioca chips from Central Market. These snacks pair well with Suriname’s Parbo beer. Have you been to Paramaribo Suriname?